The Digital Research Library of Illinois History Journal™: The Biography of Jackie Joyner-Kersee, named "Sports Illustrated for Women" top female athlete of the 20th century. The Biography of Jackie Joyner-Kersee, named "Sports Illustrated for Women" top female athlete of the 20th century. Jackie Joyner-Kersee was born on March 3, 1962 in East St. Louis, Illinois, became one of the greatest athletes in American history. The first American woman to win an Olympic gold medal in the long jump and the first woman to compile more than 7,000 points in the seven-event heptathlon, Joyner-Kersee went on to win three golds, a silver and two bronze medals over four separate Olympics. 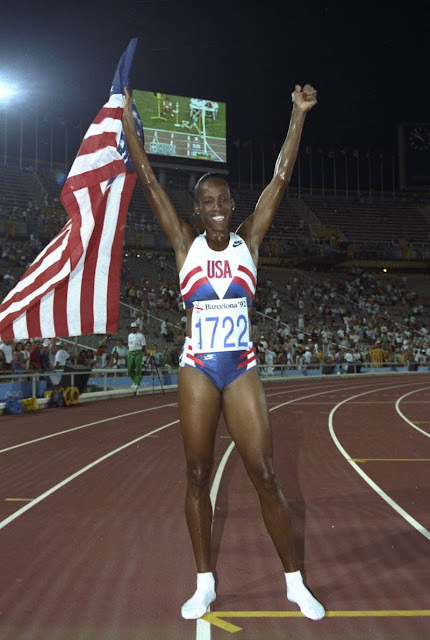 1984 - Los Angeles, California, USA - Competing in her first Olympics, in Los Angeles, Joyner-Kersee earned a silver medal in the heptathlon, a seven-event competition that includes the 200-meter run, 800-meter run and 100-meter hurdles. 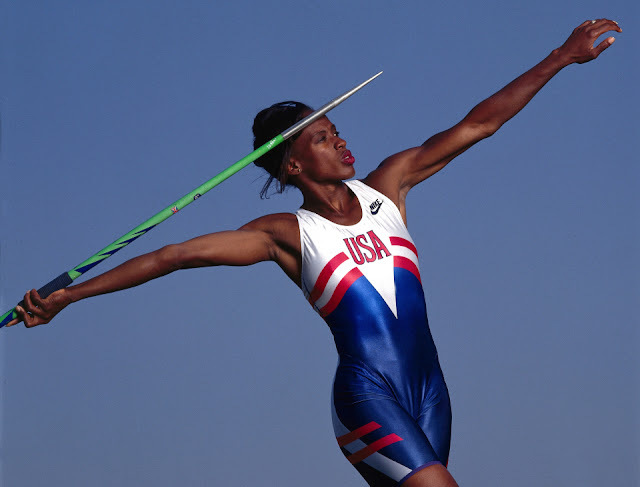 1988 - Seoul, South Korea - Building on her impressive showing at the 1986 Goodwill Games, Joyner-Kersee made a splash at the Seoul Games by accumulating a record 7,291 points in the heptathlon to win gold. Additionally, she became the first American woman to win gold in the long jump. 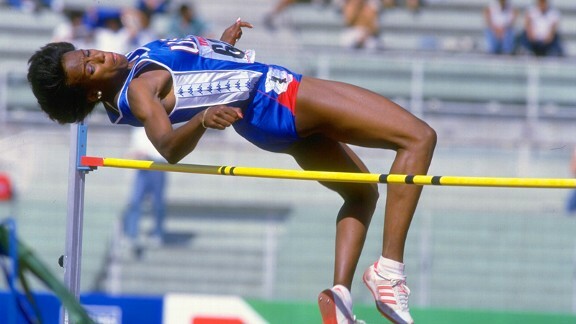 1992 - Barcelona, Spain - With her successful follow-up at the 1992 Barcelona Games, Joyner-Kersee became the first woman to win consecutive Olympic gold medals in the heptathlon. She added a bronze in the long jump. 1996 - Atlanta, Georgia, USA - Joyner-Kersee's last Olympic run came in 1996, when she took home another bronze medal in the long jump at the Summer Games in Atlanta, Georgia. She did not compete in the heptathlon that year due to a pulled hamstring. Jackie Joyner-Kersee isn't the only athletic star in her family; at the 1984 Olympics, where she won silver, her older brother, Al, won the gold medal in the triple jump. In 1986, Joyner-Kersee married her coach, Bob Kersee, who was also training sprinter Florence Griffith Joyner. "Flo-Jo" married Al Joyner the following year, before winning three golds at the 1988 Olympics. Al Joyner also briefly served as his wife's coach, before her retirement in 1989. Jacqueline Joyner-Kersee was born on March 3, 1962, in East St. Louis, Illinois. The daughter of teenage parents, she endured financial hardship while growing up, but soon rose above the pack with her athletic prowess. Among her many accolades, Joyner-Kersee won the 1986 James E. Sullivan Award as the nation's top amateur athlete, as well as USA Track & Field's Jesse Owens Award in 1986 and '87. In 1999, she was named the greatest female athlete of the 20th century by Sports Illustrated for Women, and in 2004, she was inducted into the USA Track & Field Hall of Fame. 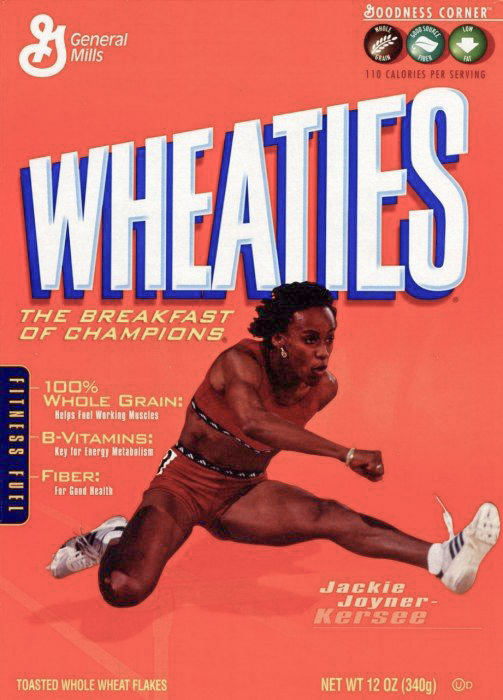 Wheaties put Jackie on cereal box in 2004. 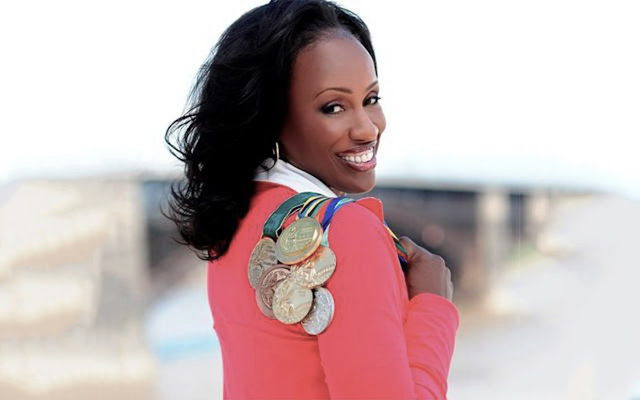 Having created the Jackie Joyner-Kersee Youth Center Foundation, to encourage underprivileged youth in her hometown to play sports, the athletic great devoted more time to the endeavor in retirement. In 2007, she helped establish Athletes for Hope, along with other champions like Andre Agassi, Muhammad Ali and Mia Hamm. This organization aims to "educate, encourage and assist athletes in their efforts to contribute to community and charitable causes," according to its website. Joyner-Kersee joined the board of Directors of USA Track & Field in 2012. In 2016, she became a spokesperson for the cable TV company Comcast. Heptathlon: a women's track and field event in which each competitor takes part in the same seven events; the 100-meter hurdles, high jump, shot put, 200-meter dash, long jump, javelin, and 800-meter run.